Amazing Montevideo – what to see and do! Uruguay is an enchanting country on the Atlantic coast, located between Brazil and Argentina. 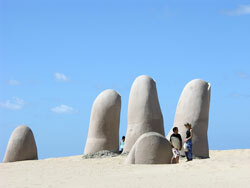 Visitors often overlook Uruguay as it is also the second smallest country in South America. This is a real shame! We would therefore like to show you what to expect whilst visiting Uruguay and studying Spanish in the stunning capital city, Montevideo. If you don’t know what much about this small Latin American country then this blog post will hopefully help! Make sure you prepare yourself for amazing Montevideo. Find out what to see and do when attending an incredible Spanish language course in the most important city in Uruguay.